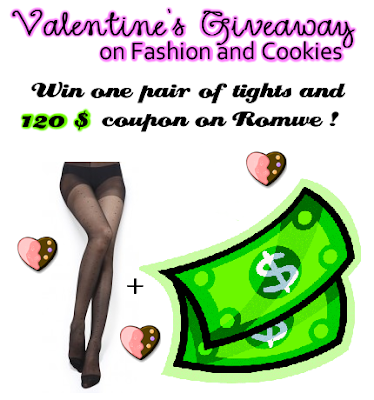 Valentine's Romwe Giveaway on Fashion and Cookies ! Dear followers, as I promised here's a brand new Giveaway for you, thanks to Romwe.com ! This special Valentine's Giveaway gives the chance to one lucky winner to win one pair of tights and a 120 $ gift certificate on Romwe.com website to buy anything you want !. The giveaway starts NOW, it is open worldwide and you will only have to fill in the rafflecopter form you see below and follow the compulsory rules that will be asked there step by step. To take part in this Giveaway you have to fill in the Rafflecopter form, deadline is Valentine's day, 14th February, last day to enter the Giveaway ;-). The winner will be announced on the blog the following day, I will send Romwe the name and e-mail the winner used to register on Romwe.com and they'll contact the winner directly !. Good luck everyone !. Cari followers, come promesso ecco un nuovissimo Giveaway per voi, grazie a Romwe.com ! Il premio di questo speciale Giveaway di San Valentino, per un fortunato vincitore, sono un paio di calze a scelta e un buono da 120 $ da spendere su Romwe.com !. Il Giveaway inizia ADESSO, è aperto a tutto il mondo e dovrete semplicemente riempire il modulo di Rafflecopter che vedete sopra seguendo le regole che vi saranno chieste passo dopo passo. Il Giveaway termina il giorno di San Valentino, 14 febbraio e il vincitore sarà annunciato su questo blog il giorno dopo ! Invierò a Romwe i dati di chi ha vinto, nome e mail usata per registrarsi sul sito e provvederanno loro a prendere contatto con il vincitore. Buona fortuna a tutti !. WOW!!!!!! Thank you so much for this GIVEAWAY!!!! partecipo molto volentieri!! compilato il form!! Great contest! Romwe is a great site! Great offer for your readers... wonderful...! I´ve registered for Romwe, but I dont understand what you mean with giving out my email with the registation of Romwe, could you please send me a message with explanation to my blog? Thank you. Thank you sweety! I will follow you, please follow me back! Thx for the inspiration and the great giveaway! following you via Twitter, posted in on facebook, liked on facebook, followed you via Google Friend Connect,and following you on Bloglovin. I really wish to win!! I registered in Romwe and followed all the steps that you asked! Thank you so much for inviting me to join this awesome giveaway Vale! what for a wonderful giveaway. i'm already a follower- i follow you everywhere since a long time. Hi, it's topogina. I've done a few things as I don't have a twitter account yet but I'm already following you on FB, GFC as cecrisicecrisi and as topogina now and following you on blogloving. I thought I messed it up as I had to sign up twice on rafflecopter but I think the system noticed it ans did not count the double entry! thanks for inviting me, I love Romwe! i follow you since a longer time- everywhere. WOW that is a huge and gorgeous collection!! I love nailpolish too and have kept my nails long for about fifteen years now but i somehow can only own ten at a time! Am already following you and hope you follow back as promised, can't wait for your future posts!!! Grazie per il commento sul blog, partecipo volentieri! Che bel giveawayy ^-^ partecipo volentieri!! !Su fb sono Monyka Marinelli e la mia e.mail di registrazione a romwe è monica-avon@live.it!! Oh my god!! I have to win I love romwe!!! !